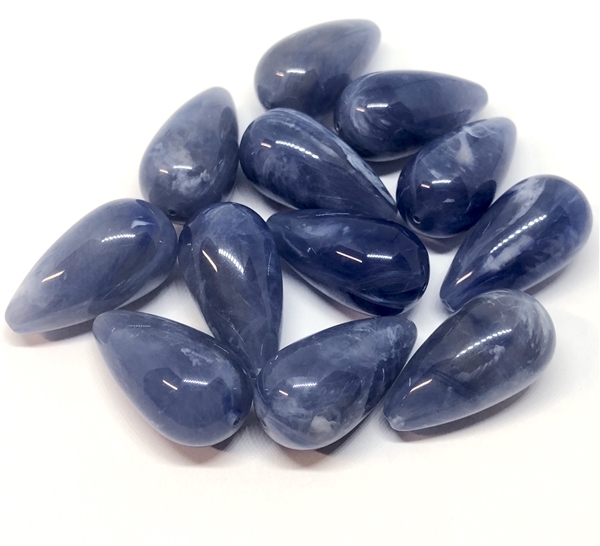 Vintage lucite Italian teardrop beads, faux sodalite, teardrop beads, beads, teardrops, jewelry making, vintage supplies, B'sue Boutiques. Beautiful faux sodalite, just yummy! Teardrop shape beads. Measuring 26 x 14mm. Twelve (12) piece lot. Sold by lot. If you haven't tried any of these vintage lucite beads, you are in for a treat. I bought all of the colors in these drops, and they are all gorgeous. Very smooth and shiny and I can't say enough about the colors. Any of the colors are good. Don't miss these limited mixes. You will love using them.